It begins each year with the first frost. Around the time the calendar flips to October, I find myself sneaking glances at the high peaks forecast and pulling out my screamers. Rock season is still in full swing, but I start calling a few ice partners to sort out schedules. Three days, we tell each other, it only takes three days of freezing temperatures. 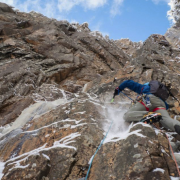 The calls go out to limited people — a devoted cadre of climbers with a passion for the unofficial opening act of ice season, the seasonal first ascent of the Black Dike. 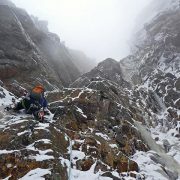 Ryan Stefiuk, Michael Wejchert, Peter Doucette, Elliot Gaddy — all strong climbers, all solid partners, who become competitors and co-conspirators as we all jockey to be the first to reach the top. 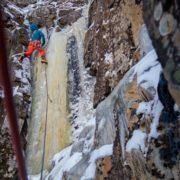 Three days (and more importantly, nights) can transform the rotten, black chimney on Cannon Cliff into the most famous ice climb in the North East, and we all know it. The Dike in early season fully lives up to its reputation. Every member of this team of rivals knows what they are in for. The first pitch will be covered in half-an-inch of ice. 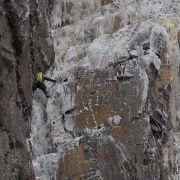 An eggshell-like layer covers the rock, and often the only gear is a cam less than halfway up. The next pitch is scratchy chimney climbing with only a handful of ice sticks, all of them thin. 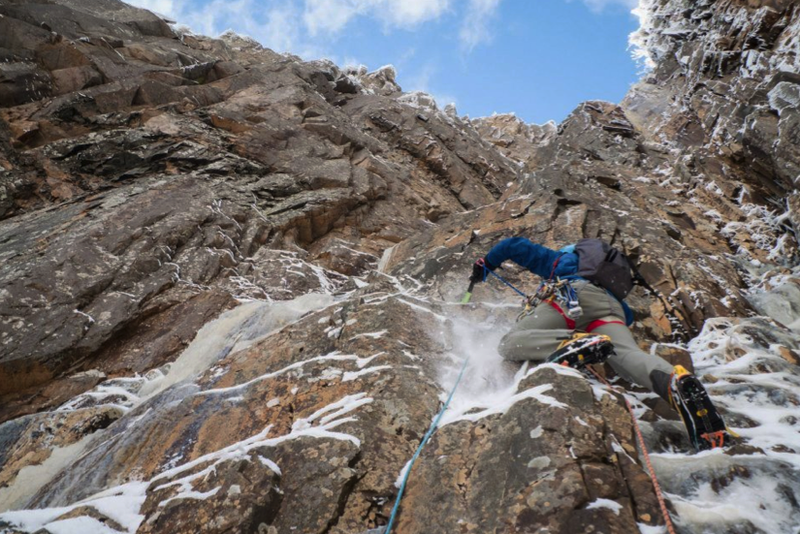 Launching off the belay is still the crux, but unlike mid-winter you never get the respite of a buried pick. 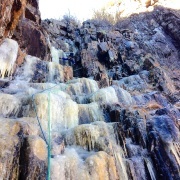 The third pitch may or may not have enough ice to keep it safe. Some years there won’t be a screw placement on the entire route. Even in good years 10cm is as good as you’ll get. Every year is a reaffirmation. Thin, terrifying sticks have a reassuring way of letting you know THIS ISN’T SPORT CLIMBING. It is winter again. Time to get ready, ice season is here. This year the starting gun fired on Election Day. Ryan drove three hours to meet me, and we found eight screw placements, several of them solid. Michael was close on our heels the next day — he soloed and rope-soloed his way to the top before driving to Mount Washington and climbing Damnation. Two days later he and Ryan tried Fafnir but found it lacking. Last year Peter and I found extremely thin ice days before Halloween. We left the parking lot at 5 a.m. and were back down by 10 a.m. Two days later Elliot and Michael found sections barely frozen in place. Two years ago Ryan and Michael made the first ascent, and a day later the three of us gave Fafnir a try. Four years ago Ryan and I stood atop Cannon first. Every one of us will likely climb the Dike later in the season, maybe with a client or friend in tow, but we migrate to Cannon each fall because of what it offers. For one ascent each year the Black Dike represents the outer limits. 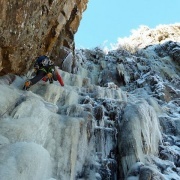 It is the hardest ice climb in the North East again, if only for a few days. It serves as a reintroduction to the sport, and each year we clamor over each other for the chance to get reacquainted. If you want to join the team start watching the weather next October. And if things look good make sure to give me a call.